They're straight, they're stupid, and they're back. "Hillary's an old bird who fooks up on her computer!" slurs Mancunian icon Shaun Ryder on Black Grape's "Everything You Know Is Wrong -- Intro" after addressing Donald Trump with the same amount of respect anyone else would direct to a pile of mud. After summarizing Secretary Clinton's email controversy in such a simple and vulgar way, we hear the sound of a modem connecting to the internet! Gosh, the last time most of us heard that sound was the last time Black Grape had an album. After Ryder and his musical right-hand man, Bez, decided to dissolve the Happy Mondays in the early '90s, they teamed up with Kermit Leveridge of the Ruthless Rap Assassins and some phat horns to get a new bad -- Black Grape -- off the ground. Their 1995 debut, It's Great When You're Straight...Yeah, was surprising for two reasons: 1) Ryder and Bez hadn't hedonized themselves into an early grave and 2) it garnered more goodwill than the Mondays's [at the time] final album, Yes Please!, which holds the distinction of driving Factory Records into bankruptcy. Black Grape's sophomore album, Stupid Stupid Stupid, kept the good vibes flowing, and that was it for about 20 years. Now Ryder and Kermit have reunited under the production supervision of Killing Joke's Martin "Youth" Glover to make Pop Voodoo. So, how does the Black Grape of 2017 compare to the Black Grape of 1997? To be honest, it's an improvement (which is something I wasn't prepared to admit). Stupid Stupid Stupid sounds thin and flat compared to the bolstering that Youth provides for Pop Voodoo. It's also more fun than the Happy Mondays reunion album, Uncle Dysnfunktional, which felt more like a sentence to serve than a listening experience to enjoy. Pop Voodoo is built from 12 solid grooves that drizzle the extra treats on top like a confection: not necessary, but really nice to have! Some of these grooves are driven by that Madchester syncopation from 25 years back, like on "Whiskey, Wine and Ham", "Money Burns", and "Losing Sleep". Others are strengthened by horns that play only the notes they need to, like on "Nine Lives" and "I Wanna Be Like You" ("Still smoking weed at 74!"). Some can even give you '70s soul or '60s British Invasion flashbacks, like on "Set the Grass on Fire", "Sugar Money", and "String Theory". 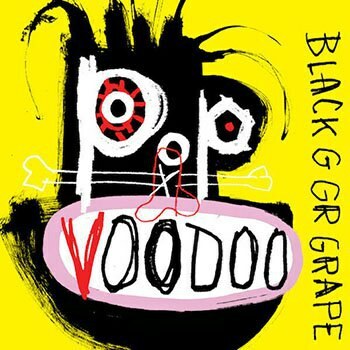 If you can't talk yourself into believing that Pop Voodoo is the perfect album, it's at least easier to admit that it's a lot of fun to listen to and comes bearing few clunkers. Strangely, Pop Voodoo's biggest bid for your attention winds up being its flimsiest offering. "Everything You Know Is Wrong - Intro" works more as a piece of performance art (witness the video) than a solid single -- maybe the addition of the word "Intro" to the end is supposed to lure us into taking it less seriously than we normally would. For all of Ryder's ribbing of the current American president, the choruses just don't have the punch they should. They saxophone solo, though? Oh yeah, that's some welcome wackiness. But when Ryder rails against politics turning personal, he can't seem to get the words out right. The fact that his stumbling and stuttering was considered to be the stuff of a final take means that Shaun Ryder isn't about to consider refining his act. Youth and Kermit can try to bring Ryder into a more accessible orbit for the rest of the world to swallow, but he's always going to drive his music like a three-wheeled car. "Speed up, so you don't stop / Slow down so you don't quit", he advises on the final track, "Young and Dumb". If Ryder continues to hone his happy medium, the Pop Voodoo might wind up being just the beginning of a late career renaissance.